the screen, linear movement forward at the same time, the material feeding from the feeder evenly into the screen, screen material, produce the specification through multi-layer screen material, separately from their respective outlet. The utility model has the advantages of low energy consumption, high output, simple structure, easy maintenance, complete sealing structure, no dust overflow, automatic discharge, etc., and is more suitable for assembly line operation. Packaging Details:packed in standard export wooden case packing.If you have specail requirements, please just inform us. 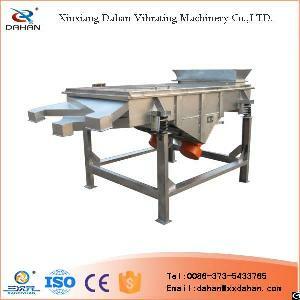 Company Name: Xinxiang Dahan Vibrating Machinery Co., Ltd.